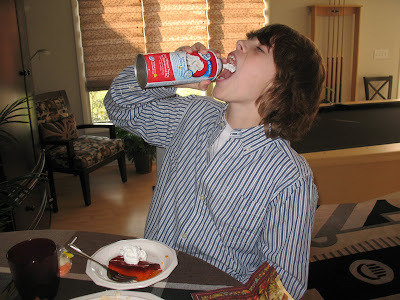 October 4, 2008. My Grandpa drove my Grandma to Lodi for Matt's soccer game. It was about to be her birthday. She didn't know that TJ and Julie were coming. Can you see me sitting in the car with her? We are talking about girl stuff. This was a pretty big birthday for my grandma because she had a very bad fall last year and we were not sure she was going to survive. She spent many nights in the ICU because she had bleeding on her brain. I went to visit her in the hospital but she does not remember me being there. Then she had to spend several months in a rehabilitation center so they could teach her to walk again. Here she is standing all by herself. Yah Grandma!! We are waiting to ride a little train around the Lodi Outlet Mall. Do you see us all in this train? It was a cute train. My grandpa LOVES trains. So the day I found this train I knew my grandpa had to come ride it with me. OH that was fun. Now we are off to dinner at Bob Evans. Look at us. How silly we are. Matt found these little pumpkins and gourds sitting on this display. And you know Matt, always has to be exploring and touching things. It was a very good day. We are so lucky Grandma is better now. I love Saturdays. First I have music therapy at the Cleveland Music School Settlement. This is Jennifer and Jenny. 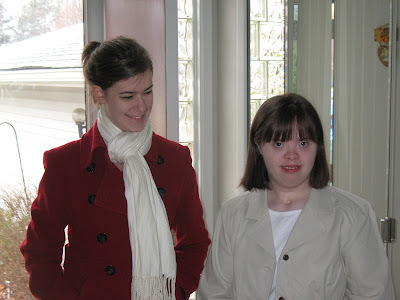 Jennifer is my music therapist and Jenny is a college student at Case Western Reserve University. She volunteers on Saturday to be with me. We sing and play instruments. Usually there is also another student with me. 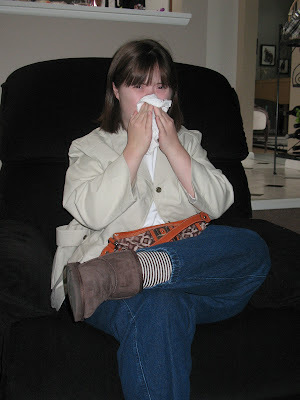 Her name is Taylor but she was sick today. Right after music we go to Camp Cheerful for my Therapeutic Riding. This is my favorite horse. HIs name is Ridge. Jessica is fixing my stirrup. She is the instructor. Holding my lead rope is Doug. I love Doug. He is a volunteer with this riding program. He has been with me for many years. How do you like Ridge's purple bridle? It is such a great fall day, we are going on a trail ride. The trees are just starting to turn colors. Behind me is a high ropes challenge course. It is completely handicapped accessible. Kids that are totally wheelchair bound use this. 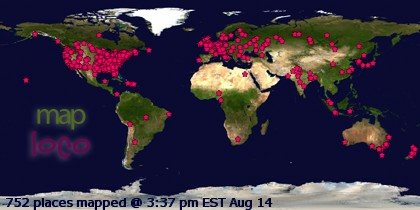 How cool is that. My mom thinks this looks like a postcard. She likes to just stand here and look at the beautiful landscape while I am riding. We are in Strongsville, Ohio. It is about 45 minutes from where I live, but it is so worth the drive. A MESSAGE FROM MOM: Sarah first rode a horse at Girl Scout camp and loved it, so I thought she might enjoy riding lessons. 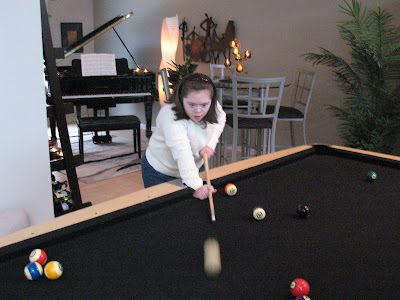 Many areas have therapeutic riding programs but our philosophy over the years has been to first enroll Sarah in activities in our community that her school age peers are in. We first started at an equestrian center not far from our home at the suggestion of a neighbor. 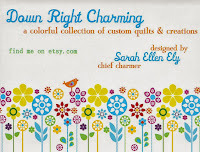 Sarah really enjoyed it and was progressing nicely. Then one day she witnessed a girl fall from her horse. The girl began screaming very loudly and continued to hold onto her reins as the horse tried to get away. This confused and hurt the horse so he became agitated which caused for a few tense moments. 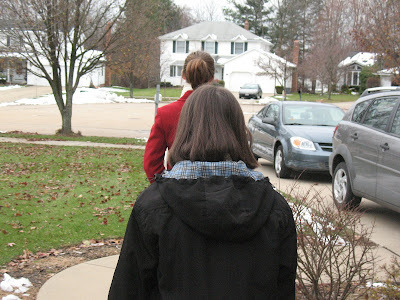 From that point, I could not get Sarah near the barn without her crying hysterically. So we stopped going. A few years later the resident camp that Sarah attends each summer built an indoor arena and began to offer therapeutic riding. It is a good distance from where we live, but I hated that Sarah had ended her riding with such a bad experience. I thought maybe since she was familiar with the camp, she would be more comfortable there with the horses. I was wrong. It took the staff and volunteers three months or more before Sarah would even enter the ring with a horse. The difference though was the training they received because it is a NARHA accredited center. 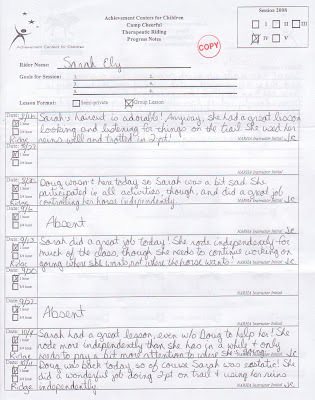 Each week they patiently and gently worked with Sarah in the stall area until she was comfortable petting the horse. 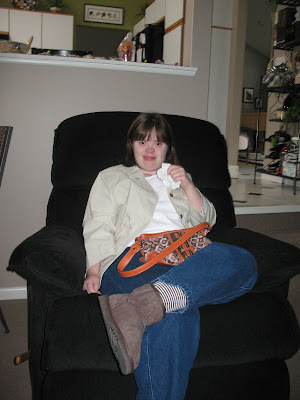 From there, they had a plan that eventually got her back on the horse utilizing the wheelchair lift they have. Slowly she started to make progress. It has been about three years now, and each session she is doing better than the one before. She now really looks forward to her ride each Saturday. 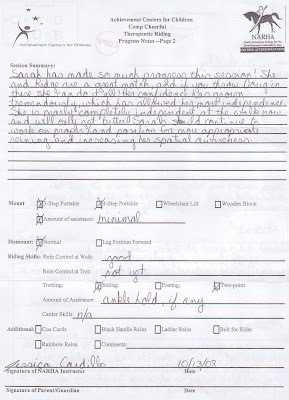 I thought you might like to see the report we got for the last session. I just love how independent and confident she is becoming. As you read this, you will also pick up that there is definitely a love affair with Doug. What a great and dedicated volunteer he is. I wonder if it is By Chance or By Design that he is scheduled on Saturday and has this special relationship with Sarah? 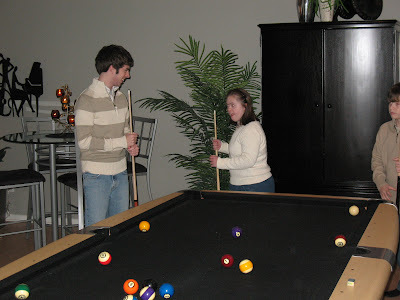 An ultrasound during my pregnancy suggested that I was carrying a girl, so I was thrilled when Stacy was born in July, one month before my due date. Her family lives directly across the street from us, so I fantasized about our little girls being best friends. The night after I delivered, I had a dream about Stacy and Sarah having tea parties, playing dress up, doing each others hair and having pillow fights at sleep overs. 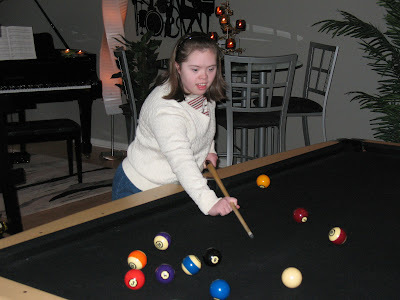 Shortly after waking up the next morning, the doctor told me he thought Sarah was Down syndrome. My dreams of the little girls being best friends were shattered. 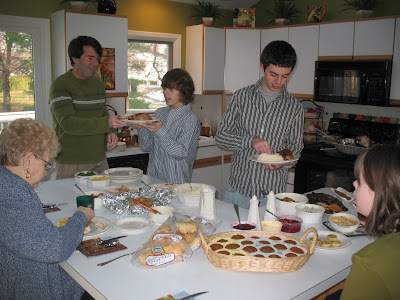 For days, I avoided Stacy's entire family. If I saw them outside playing, I would be sure to stay inside. I didn't want to have to tell them about our diagnosis. 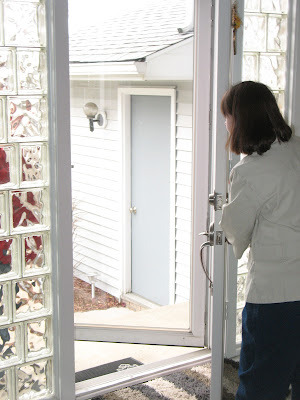 Eventually, I pulled together enough strength to let them in on our little secret. 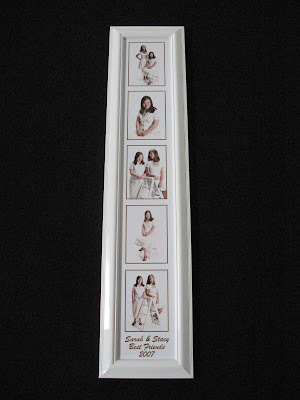 Is it By Chance or By Design that Stacy and Sarah quickly became playmates. When Sarah was just a toddler, I was given a copy of the book Circles of Friends by Robert and Martha Perske. Chapter 3 begins, "Friendships are such an everyday thing, we just take them for granted. They are like electricity, telephone, clothing and three meals a day - we anguish only when we are deprived of them. 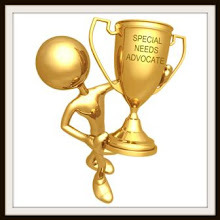 And yet we have just begun to sense the pain experienced by people with disabilities when they are deprived of mutually satisfying friendships with ordinary people." 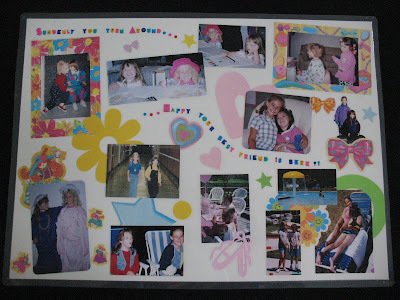 At the time, I remember reading the book, more interested in the beautiful illustrations of darling children with Ds. The words did not seem to have a particular connection with me. Looking back, I simply didn't get it. 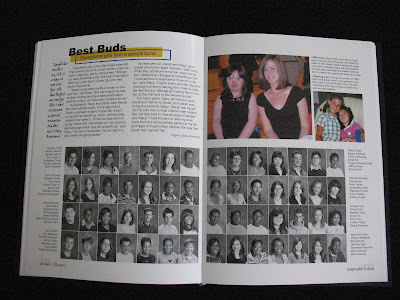 In 2007, the Brush High School yearbook editors decided to write stories about friends. Without giving me the details Stacy told me she agreed to share her story of her friendship with Sarah. The day the book came out, I started to get calls from teachers who worked at the high school. They could barely tell me about it without crying. Then parents of other students started calling. They too were having a hard time describing it. Finally, I drove up to get Sarah's copy. Why I had to read it before getting to the car is beyond me. I was sobbing. Hysterically. The security guards stopped me to ask if I was alright. The assistant principal asked if he could be of help. I made it to the car, calmed myself down, and then called Stacy on my cell phone. I tried to tell her how much I liked the article, how much I admired her inner strength to share her story, and how much I loved her. Robert Perske goes on to write in the book, "we need to view a good friendship the way we look at a sunrise, seeing it in all its radiance." That's why I was so emotional, and I suspect the other adults too. I finally got it. Sarah has been genuinely blessed to have such a beautiful friendship with Stacy. True friendships are to be envied. They generate their own energy, their own passion, their own life line. When the literature for Sarah's senior portraits arrived, it advertised a special friendship package. It didn't take a second thought to know that there would be two beautiful young women at that photo shoot. 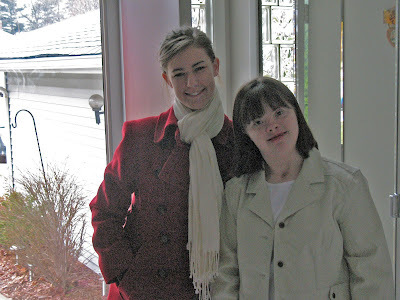 My wish for every child with Down syndrome is to be blessed with a friend like Stacy. There is nothing richer in this world. I am already to go out. I have a cold though. My eyes are watering and my nose is running. I look pitiful. It's my BFF (best friend forever) Stacy!!!! 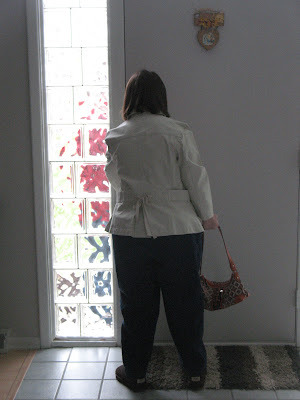 She is home from college and she is going to take me out to lunch. Stacy and I have been best friends since we were little girls. 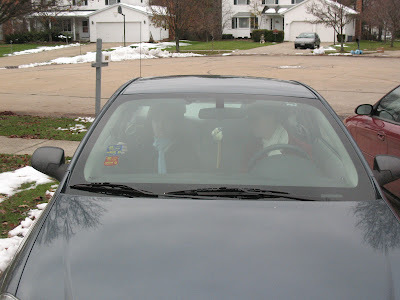 It was such a beautiful fall day and the guys were at Matt's soccer game, so my mom and me decided to take a ride. We ended up at the Hinckley Reservation. We had never been here before. I watched the little fish swimming for awhile. Then we walked over to the sandy beach. It was too cold for swimming today, but you can swim in this water in the summer. ...and here I am at the top. It was so quiet and peaceful here. We sat on this bench for a long time and watched the water and those people fishing over there. Do you see them? They caught some little fish. I like when the leaves start to turn colors. It is pretty like a painting. 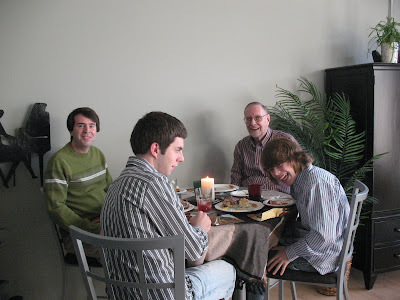 Thanksgiving 2008 ~ We often go out to eat or bring dinner in from a restaurant on holidays, but for some reason we were in the mood to cook this year. 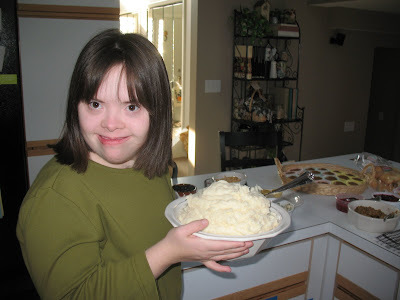 I was in charge of the mashed potatoes. 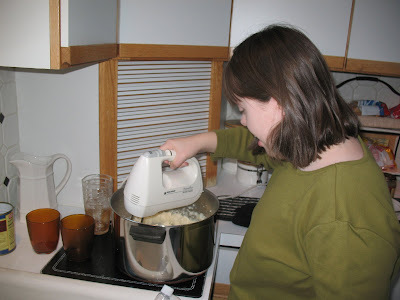 So here I am mashing away. Wow, now that's a bowl of potatoes. Looks like everything is about ready. Time to eat. 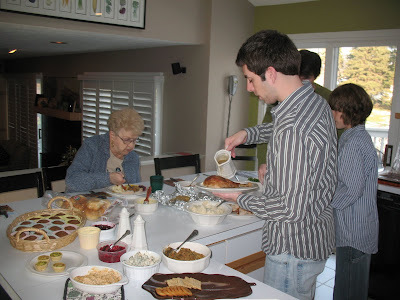 We let Grandma eat first. 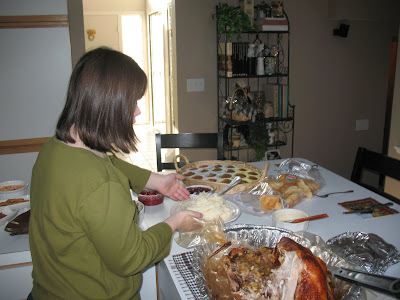 She does not remember Thanksgiving last year because she was in the hospital. I'm waiting for the guys to fill their plates next. We put them at the table in the jazz club. 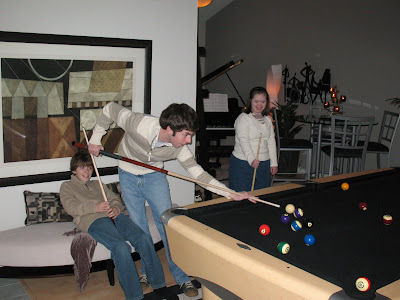 That's what we call our old living room that we put a pool table in and the dining room that we moved the piano into. They all talk about football and stuff. 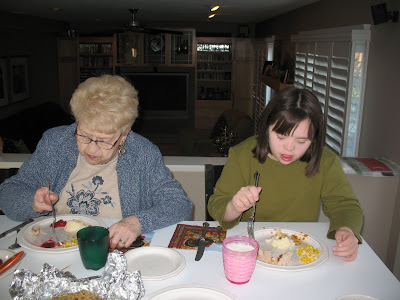 I ate with Grandma in the kitchen. My mom hung out with us too but she did not eat. She said she was stuffed from sampling all day long while she was cooking. 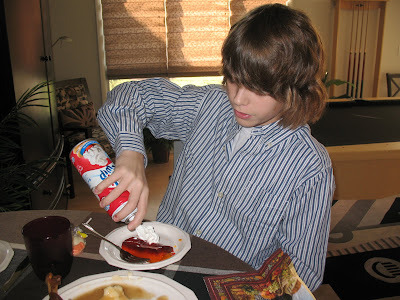 Matt always gets to put Redi-Whip on his jello on holidays. Then guess what he does? Here is the cake I picked out at the store. I don't like pumpkin pie. 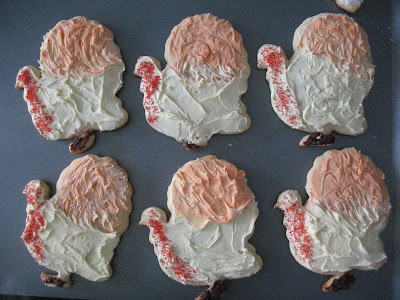 My grandma made these turkey cutout cookies. Aren't they cute? 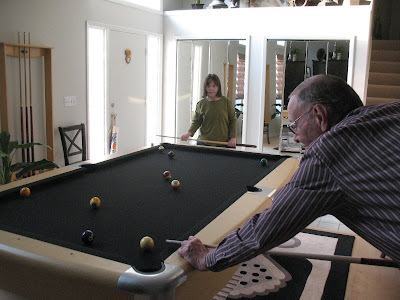 After dinner grandpa played pool with me. We had a very good time. I'm glad my grandparents were able to be with me today. 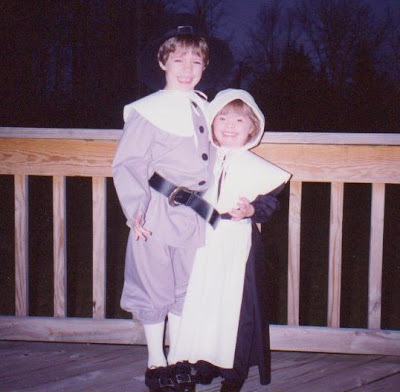 For Thanksgiving 1993, my mom made TJ and me pilgrim outfits. Every year we get this picture out to look at it again. TJ was almost six and I was four. 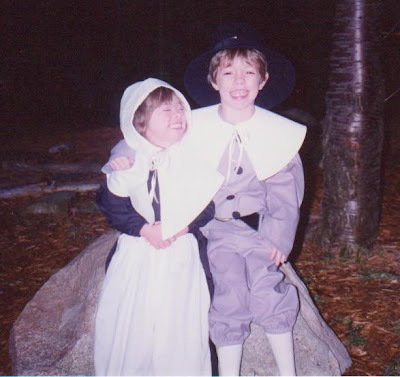 Here we are sitting on Plymouth Rock - LOL. 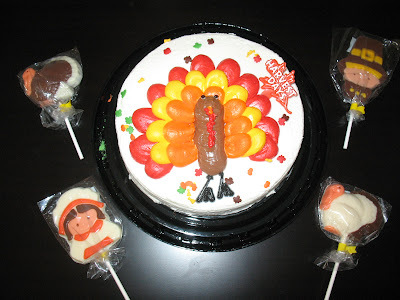 We wish all our blogging friends loving wishes for a very warm and Happy Thanksgiving. Do you see the picture I painted of a turkey hanging behind me? 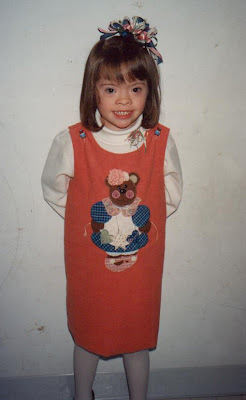 I am five years old in this picture. I was in the big kids class at pre-school and we got to do lots of neat artwork. 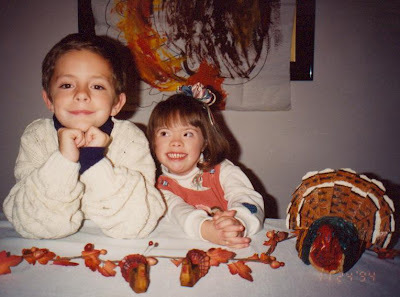 This is the year I learned a new Thanksgiving song: The Albuquerque Turkey. I loved trying to say that big word. And he wobbles and he gobbles and he's absolutely mine. He's my Albuquerque turkey and I'm awfully proud of that. 'Cause for our Thanksgiving dinner, we have egg foo yung instead. For some reason this song just made me crack up. Oh my mom wants me to point out the wall behind me. You really can't see it to good in this picture, but I decided to draw a big picture on this wall. I used a black permanent marker :) My dad scrubbed and scrubbed but he could not get it off. So guess what? It just became my coloring wall for a while. I am so happy TJ is home from college. 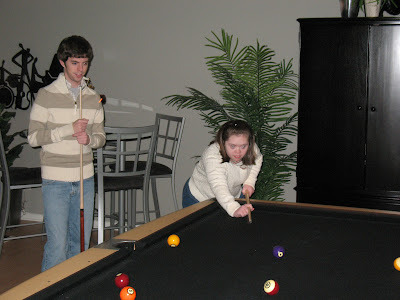 I have been practicing my pool skills and I can't wait to show him. 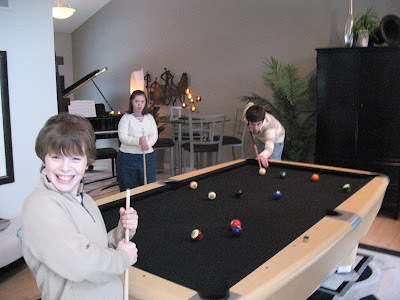 I love shooting pool with my brothers. It is a good time. Matt is always being a ham. Hey, speaking of ham, that's what we usually have for Thanksgiving dinner. None of us really like turkey so much. I think I just scratched. Everybody loves how I say that word for some reason. Yes, I did just get that ball in. Now step aside big bro, so I can keep my luck going.